I’m so excited about this post! It’s going to cover one of my very favorite costumes. The charming and gilded Lumiere! Of course, I loved every costume I made, but aside from Belle, Lumiere was definitely my favorite. I loved so many things about it. The glowing candles I was able to make with a few simple supplies, the absolutely PERFECT fabric I found…. But hold on. I’m getting ahead of myself. Unlike Belle’s blue dress, I didn’t get much in the way of design for Lumiere from the live-action film. Although I loved the way they protrayed him, a computer generated image doesn’t exactly transfer to the stage well. Instead, I looked to other theater productions for inspiration. A google search for images of “Lumiere theater costume” yields all sorts of great ideas. From costumes that try to make him look as much as possible like a candle-stick, to those that let him keep his human form mainly intact, and just use candles and shimmering fabrics to get the gilded look. Since this was a youth theater production, I decided to go simpler (and easier for changing to become “human again) if I let him keep his human form. Besides there’s one thing I DID get out of the new movie, it was an image of how a candle-stick could look quite decidedly human! So, I sat down with my colored pencils and started sketching again. I’m very familiar with 1700’s clothing (having grown up doing re-enactments) and I’ve made period-correct clothing both men and women. So I felt pretty confident with the breeches, shirt and vest. The only part I was a bit intimidated by is a jacket, which I’ve never made before. Hence why I went with just a vest in my original sketches (though that changed later on, as did the candle hat idea). It was a bolt of shimmering gold brocade. Not the matte gold of a tablecloth, but luminous and sparkling! When I got up close I could see it was dusted with glitter that caught the light and gave the fabric a hint of metallic gleam. I knew at once that matching suit of that fabric would be SPECTACULAR! There was just one small problem… It cost $5 a yard! Compared to the great deals I was getting on thrift store finds, that seemed crazy expensive! In the end though, I decided to go ahead and splurge. And I am SO glad I did. It was completely perfect for Lumiere, combined with some shimmering gold thread (which I bought for Belle’s gold gown but had excess of), and some metallic fabric and ribbons I found at various thrift store. As for candle supplies, I used several things I had on hand (a cardboard tube, plastic bowls, hot-glue) as well as some thrifted gold fabric, white spray paint, and two battery-operated tapers. Because of the electric candles ($10.97) and the almost the 4 yards of fabric I got from Walmart ($20.91), Lumiere’s costume ended up being one of the more expensive ones I did for the show. With the additional ribbon/trim/gold fabric, the total came to around $35. But that was still a pretty good deal compared to buying or renting costumes. So I felt good about it. Unlike Belle and the Bimbettes, Lumiere’s costume required two distinct kinds of construction. Sewing for the main costume, and lots of glue, paint and DIY craftiness for the candles. Let’s start with the suit. I already had this historical pattern on hand that I could use to make the knee breeches (pants) and vest. Somewhere during the planning process though, I decided Lumiere really needed a jacket. His elegant, suave persona just seemed to require coattails swishing behind him! So I started shopping for a jacket pattern on ebay. Sometimes you have to be creative to find the best deal. 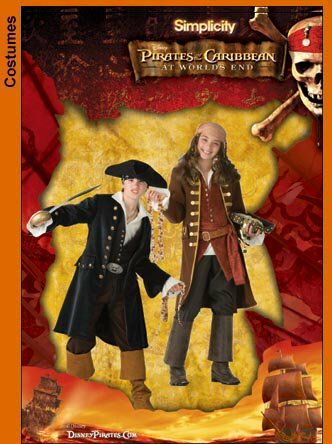 After searching for “historical”, “colonial”, “revolutionary war” and “George Washington” and finding all the kid’s patterns rather expensive, I eventually found a somewhat battered copy of this Pirates of the Caribbean pattern for just under $10 (including shipping). I figured I could easily adapt it to look less “pirate-y”. I ended up using both the vest and jacket pattern included, but went with the breeches from my historical pattern, if I am remembering right. I cut out the jacket pieces first, because I wanted to make sure I had enough fabric for that if nothing else. Then I cut out the breeches, and finally got to the vest. I ended up not having quite enough for the whole vest, so I used some pieces of a striped gold tablecloth for the back of it. The vest and breeches were both easy to put together. The breeches were cut out of two main pieces for the legs, and folded over at the waist and below the knees to create casings for elastic. I didn’t bother lining the vest, since it was an under-layer anyway and only showed in front. I just serged all the edges instead. I had bought gold buttons in bulk off Ebay, since I knew I’d need a lot for the various men’s costumes. After adding those on, as well as some ties on the back made from gold I found at a thrift store, and the vest was complete. I was looking for plain gold buttons, but these ended up being cheaper. And fancier too! Although my historical pattern from Townsends included a shirt, I decided it was silly to spend time making shirts that would mostly be covered by vests and jackets anyway. Instead, I used an ordinary white dress shirt from the thrift store. It was pretty easy to use fabric scissors and trim away the modern collar, leaving just the narrow collar band, which pretty much mimics the look of historical shirts like this one. If I’d had more time, I would have used a serger to make sure that raw edge didn’t ravel. But as it was, I just left it. There was definitely some raveling by the end of the show, but not enough to detect from the audience. You can see the collar raveling where I cut it. The pattern also called for pocket flaps, and buttons down each side of the front opening. But I ended up skipping both. I don’t like skimping on the details, but sometimes time/budget make it necessary. My improvised back slit finishing. Another change I made was on the sleeves. Instead of doing the wide cuffs from the pattern, I sewed in ruffle of lace poking out from the inside. Historically, this lace would actually have been attached to the shirt-sleeve. But it was simpler to just attach it to the jacket, so that whatever shirt is used the lace will still be part of the costume. The final piece was a lace cravat, which I made from some gorgeous lace curtains I found at (you guessed it!) the thrift store. I made these for multiple characters in the show, and I’ll cover the construction in more detail when I do a post on the Prince/Beast. Now, on to my favorite part! To make the candles, I decided to go with a hot-glue technique I saw in several videos like this one. and use battery-operated tapers to create the flame. (I bought these off Amazon). The first step was to enclose the tapers inside tubes to create the illusion of thicker candles. Rather than using paper towel rolls (which would have been delicate), I found a cardboard shipping tube in the corner of my craft room (score for hoarding random craft items!). The cardboard was so thick and dense that I used an electric saw to cut it! I made two pieces, each long enough to hide a taper inside, and then cut out small circles from a cardboard box to fit the top of the tubes. Next, I poked a hole in the middle of each circle, just big enough to squeeze the rubbery “flame” through. Using hot-glue, I secured the circle on the top of the tube, and then used wire to hold the candle steady near the bottom, threading a loop through holes on each side of the tube and pulling tension in both directions to keep the candle firmly in the center. The wire ends I twisted together tightly on the outside, and used hot glue to coat the twist and fill the holes for extra security. Next, I used LOTS of hot glue to cover the top of the candle and create “drips” down the sides. I usually use a low-heat gun for crafts, so I’m less likely to burn myself, but I switched to a really hot one for this step, because it was taking way too long the other-way, and the project had already dragged on after midnight. Of course, I then forgot to pay attention and gave myself a second-degree burn at 1 a.m. in the morning.Thankfully it was quite small, so I just sort of wrapped it up with an ice-cube and kept working. (The show must go on, people.) I also ruined one of the tapers by accidentally pulling the rubbery cover off the flame bulb. Thankfully I had two spares. On the second try I made the tapers somewhat easier to take out, so that I could replace if anything went wrong. Once I finished with the hot-glue and switched on the candle to see how it looked, I was really happy with how things were taking shape. Time for a paint job! I made little foil caps to protect the flames poking out the top and then used white spray-paint to coat the rest of the candle. The last step was making the candle “holders.” I had already measured and cut two plastic bowls, ready for the candles to stick through. Now I just covered them in the same thrifted gold fabric I’d used to edge the jacket. Basically I just used a rectangle of fabric, long enough to fully circle the outside edge of the bowl. The excess I just folded down in pleats and glued to cover the bowls. I also added a wide ruffle on the bottom to cover the handle end and hide the actress’s hands when in use. As I’m sure you could tell at the beginning of this post, I was extremely happy with how my Lumiere costume turned out. The fabric was so perfect, and so were the candles! The suit didn’t quite fit my mannequin, since it was designed for a girl in her early teens (yes, we didn’t have enough boys, so Lumiere was played by a girl), which is why the vest doesn’t button all the way up in the front on my woman-sized mannequin. The back of the vest was made from pieces of a gold-striped tablecloth (which I also used in the Prince/Beast jacket), since I ran out of the brocade. The gold ties were from a spool of gold tape stuff I found at the thrift store. It worked fine for this, but not so well when I tried to use it in the fork and spoon costumes later. The lace cravat was secured with a ribbon tie in the back. I opted for that over elastic because it was more adjustable and there was no danger of it looking too tight and/or choking the actress. I opted for a zigzag stitch to attach the gathered lace inside the sleeves, because I thought it would blend in better with the brocade. It worked pretty well. That particular lace was actually just some bulk stuff I had lying around. I would have liked to match the cravat, but there wasn’t enough, once I made all the cravats I need. As it turned out, they were close enough that unless you look close, you wouldn’t know they didn’t match. Although I didn’t add buttons to the edges of the coat, I did add strips of gold fabric that matched the candle-holders. This was part partly for decoration, but partly to give the front of the coat some weight since I didn’t fully line the jacket. This allowed the coat to “swish” but kept it fluttering around like a handkerchief. I didn’t want it to look TOO lightweight. I serged the one edge, and stitched down the other side with a straight seam and zigzag. I was happy with the way the back of the jacket turned out, despite the fact that I pretty much had to make up my own way of finishing the back slit. And the elastic in the hem of the knickers worked well to pull them in under the knee. The costume looked spectacular under the stage lights. The whole suit gleamed and shimmered when the actress moved, and the electric candle flames glowed perfectly. With the edition of a white colonial wig from the costume stash, white stockings, and black shoes with added buckles, the ensemble was perfect! So much detail. Love it!